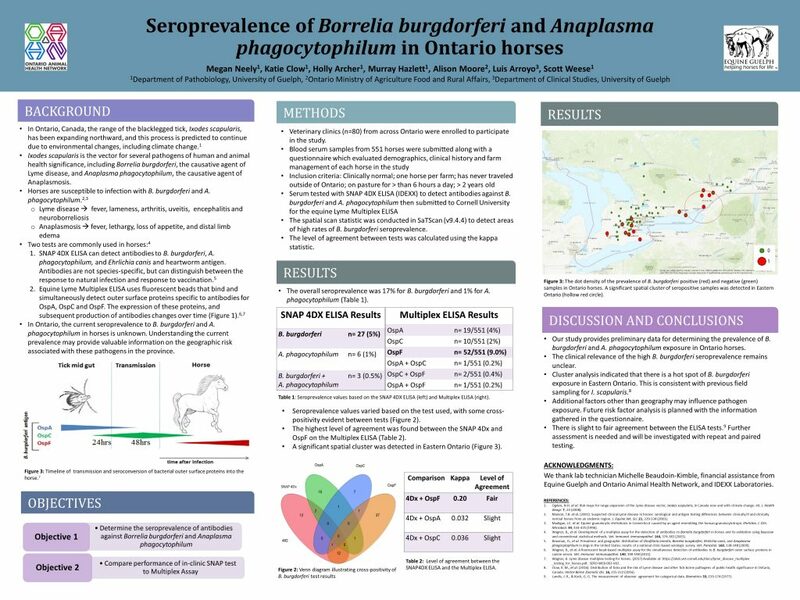 The objectives of this project were to 1) identify the prevalence of B. burgdorferi and A. phagocytophilum seropositivity in Ontario horses; 2) identify geographic risk factors; and 3) compare an in-clinic SNAP test to a Lyme multiplex assay. Veterinarians from clinics across Ontario participated in the study. Serum samples from 564 horses were submitted along with a questionnaire that evaluated demographics, clinical history, and farm management of each horse in the study. The overall prevalence of B. burgdorferi exposure for all of Ontario was 14% (80/564), with pronounced regional variability. The prevalence in horses appears to be highest in eastern Ontario, where 27 of 115 (24%) samples tested positive. The prevalence in southern Ontario was 15% (40/269); central Ontario was 10% (14/146), and in northern Ontario the prevalence was found to be 6% (2/33). Half of the horse owners surveyed reported that they regularly check their horses for ticks; however, of that, 15% reported that they have found a tick on their horse. The majority of the horses (47%) were reported to live outside 24/7 on pasture, particularly in the summer months during tick season. Not surprisingly, deer were the most commonly identified wild animals present on these farms. Further investigation into the distribution and risk factors for B. burgdorferi and A. phagocytophilum exposure will aid in the continued monitoring and prevention of the disease.